Anyone who does a podcast with us, providing me a bio in advance and does a informative podcast with will have a back link on the shows podcast page. That podcast page is posted through our syndicated WpN LIVEFEED and also back linked from my affiliate Skinny Moose Media News Media site. If you listen to Dani in the podcast, the sites with the most back links eventually win and having my optimized content just another big plus! We believe we have the best outlet for back link making in our industry. If you have read everything about backlinks you always hear related web sites rank best. We build back links for our customers the right way one web site at a time. 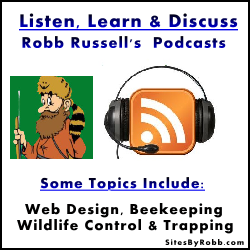 We use syndicated RSS feeds from within the Wildlife Pro Network and share your web sites and blogs with other wildlife removal and pest control companies. Every member site through our syndicated feeds updates your web site with syndicated related material every day.